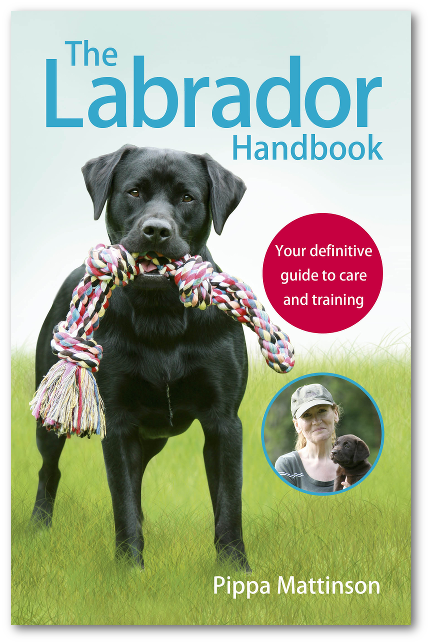 Home Labrador Training Articles Dog Shock Collar Training: Is It Worth It? Dog Shock Collar Training – How Does It Work And Is It Worth It? Training a well-behaved dog can be hard. Really hard. Training a dog to mind his manners even when he’s off his leash is even harder. 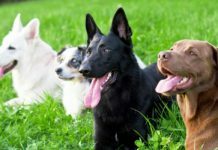 So, you might think that training a highly motivated, high energy, high prey drive dog to leave other dogs and livestock alone while off his leash is downright impossible. You might be searching right now for a quick-fix training solution regarding livestock worrying, jumping on strangers or bolting dangerously into the street. As a professional trainer, I can admit that I’ve had more bang-my-head-against-the-wall moments than I’ve had breakthroughs. I’ve had dogs that took more work to teach to lie down than it took a zoo monkey to do a backflip on cue. So if you’re not a professional dog trainer, and you’re having a heck of a time with some aspect of training your dog, know that it is absolutely OK.
Those infomercials that claim to “train your dog in two weeks with this incredible remote training system” are getting really tempting, aren’t they? Electric dog shock collars are often advertised in pet stores and on TV as a quick fix for difficult-to-train dog behaviors. Furthermore, lots of professionals in livestock management and gundog training use them. If you’re considering training with a dog shock collar, whether it’s for gundog training, herding, agility or sporting competitions, off-leash handling, or everyday behavior, please take a moment to learn the risks that are associated with these training tools. Some of the potential hazards of using a dog training shock collar include skin irritation, lesions or infections, training backsliding, causing your dog pain and stress, aggression or other problematic behaviors from your dog, and even breaking the law in some countries. So let’s take some time to weigh out the benefits and convenience with the risks of training with a dog shock collar. A dog training shock collar can be referred to as an e-collar, shock collar or remote training collar. 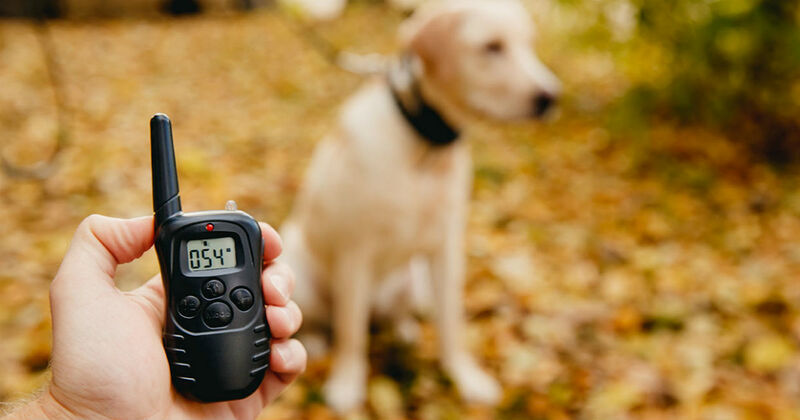 Though there are several types of remote-controlled collar, such as those with foul-smelling sprays or high frequency noises, this article is referring specifically to those collars that deliver an electronic shock to a dog’s neck for the purposes of training. Typically, the shocks are delivered by the remote control held by the trainer. Trainers use the shocks to interrupt unwanted behaviors, such as leaving a containment area or chasing livestock. They also use the shocks in a situation where a cue has been given to the dog, but the dog doesn’t perform the appropriate behavior right away. 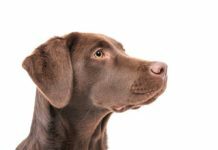 For example, when practicing with gundogs that are required to sit when a whistle is blown from a distance—if the dog doesn’t sit right away, he or she is shocked as a reminder to follow through with the correct behavior immediately. Do dog shock collars work? When used appropriately, supporters of dog shock collar training claim that training time can be shortened significantly as compared to training solely with positive reinforcement techniques. 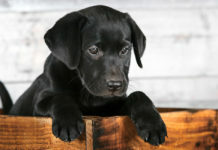 They also assert that their dogs have better focus on the handler and are more likely to follow through with a command or cue than dogs that are given a choice, as in positive reinforcement training. Conversely, any mistake made by the trainer with the remote control can create major unintentional training and behavior problems with their dog. A shock sent at the wrong moment can deter a dog from whatever he is doing at the exact moment of the shock—whether it’s picking up a ball, drinking water or even relieving herself. Trainer error and malfunctioning equipment are both major factors when dealing with this highly sensitive behavior modification technique. But those are just two drawbacks to this training technique. There are additional risks that come with using shock collars in dog training, too. Some people say that the use of these collars teeter on the boundary of animal abuse. Opponents of shock collars say that the physical punishment the dogs receive can worsen underlying behavior or health problems. Veterinarians warn that use of these collars can lead to skin irritations and necrosis. 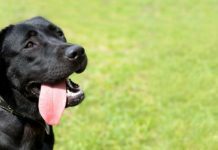 There have, in fact, been several studies in the past decade that attempt to put fact to the growing anecdotal evidence from trainers and dog owners who say that using shock collars can be detrimental to the physical and behavioral health of dogs. Dogs wearing e-collars show more signs of stress during training as well as during everyday activities. There have been several behavioral research studies that observe negative behavior responses in dogs that are trained using shock collars in comparison to those trained using positive reinforcement. A study in 2007 revealed that dogs became more stressed and tense in everyday life situations in response to wearing an electric collar during their training, as measured by salivary cortisol levels and behavioral indicators. Shock collar training can create or worsen underlying behavioral problems like aggression. 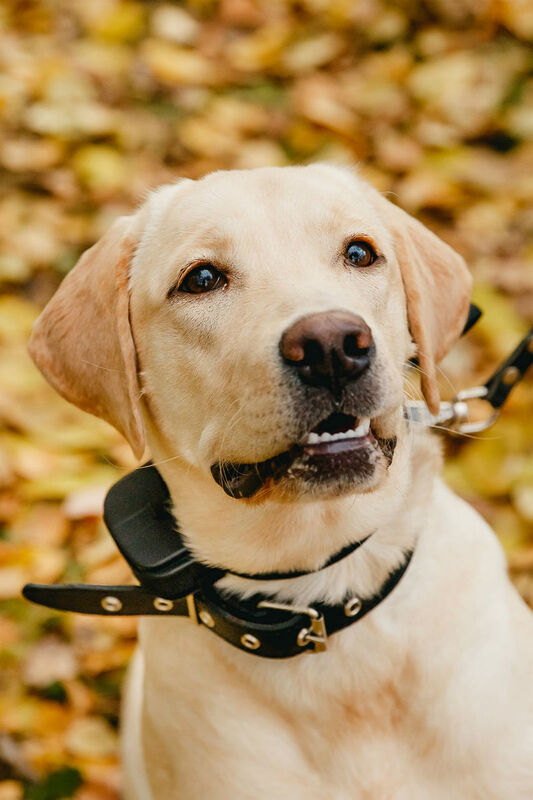 There are concerning situations that reveal that the use of shock collars during training can actually cause aggression or worsen aggression among dogs that previously had symptoms of clinical aggression. Researchers Hiby, Rooney and Bradshaw revealed that punishment-based training methods led to higher incidents of aggression and other problematic behaviors. Electric collars can cause physical damage to dogs’ necks. The warning labels inside the instructions for these electric collars spell out most of their risks, including skin irritation and pressure necrosis. Even so, I’ve personally witnessed dogs with severe injury to their necks in a pet store or veterinarian office where I was working. The dogs are brought in for grooming appointments, and the groomer removes the e-collar to discover that the skin under the collar prongs is completely rotten, revealing infected indentations into the flesh of the dog’s neck. It happens more often than one may think. In each of these cases, the owners claimed they never took the collar off, and therefore they never noticed the problem. Prolonged pressure from the collar stops adequate blood flow to the area. After time, the tissue dies, and the prongs penetrate the skin, leaving gaping wounds in the neck. They are often used incorrectly. The same labels that warn owners about the potential for skin irritation and infection also warn against using too high of a shock setting. These studies revealed that the majority of pet owners aren’t following the manuals, heeding their warnings or learning how to properly train with shock collars. Many owners admit to starting at the highest pain threshold and working their way backwards. Almost 30 percent of the dogs in one study were still vocalizing after repetitive use of the collars—indicating the owners weren’t lowering the settings to the suggested levels. Many owners admitted to never reading the instructions at all. Shock collar training is no more effective in training your dog than using positive reinforcement. Studies that compare compulsion-based training, including the use of shock collars, to positive reinforcement training methods have generally not supported the claims that shock collars are more effective at training dogs. Is My Dog Shock Collar Illegal? For all of these reasons combined, using a shock collar on a dog is already banned in many competitions and field trials. But did you know that there are countries where even the sale and purchase of these collars has been outlawed? Wales, Denmark, Norway, Sweden, Austria, Switzerland, Slovenia, Germany, Quebec and parts of Australia have already made shock collars for training dogs illegal. As of March 2018, England and Scotland have laws underway for banning shock collars. Irish animal welfare groups are following suit and calling for a government ban as well. 2018 might see the first city in the U.S. to ban these controversial devices, too. In Boulder, Colorado, there are already attempts forming to get a shock collar ban proposal on the ballot. Other Training Methods Are Available! 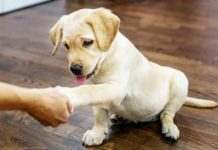 There is a reason we talk so much about positive reinforcement training methods for dogs. The research supports its efficacy. Owners are more likely to enjoy and follow through with training sessions that are fun for both them and their dog. There are few severe consequences of training mistakes by novice and pro trainers alike. There is little controversy over the ethical treatment of dogs that are being trained using positive reinforcement. In conclusion, why take the chances or risk your dog’s health when there are other training methods available? Simply using a long training leash to manage livestock worrying, distance recall, or bolting is highly effective and less stressful for everyone involved, including your dog. Ultimately, shock collars are never necessary. Next articleIs Manuka Honey for Dogs a Miracle Cure? We have a 10 month “headstrong” lab and have gone back and forth about using a shock collar to help in his training. However, as soon as we think it’s time to purchase one, he makes a jump on the learning curve. My husband and I have both decided that training takes work and lots of time and that is what we signed up for when we brought home our pup. As with children, learning doesn’t happen overnight. Thank goodness dogs aren’t children as long as humans are! 😉 We will continue with our positive reinforcement and know that in the future we will have a well behaved, healthy pup. My last 4 dogs have been trained on fence containment systems. My last 2 dogs, a female and a male, have never left the fenced area. They both know the boundries and respect them. It took me about 3-4 weeks of training at a slow steady pace to train them. I speak highly of fence containment as I can let the dogs out and not worry about them leaving the property. They are challenged daily by other dogs, squirrels and other outside influences, yet remain in the yard as expected.